Our product range includes a wide range of three phase power energy meter calibrator, single phase power energy meter calibrator and three phase secondary injection kit. We hold expertise in Three Phase Power Energy Meter Calibrator that works on input voltage of 230 Volt AC. These output voltage ranges from 0 to 300 V (L-N) or 0 to 520 Phase to Phase, and output current ranges from 0 to 6 A per phase. Further, our calibrators are known for its functionality, overload and short circuit protection. It is also provided with digital AC voltmeter, digital AC ammeter as well as universal meter to indicate PF, W, VA, and VAr of each phase. These calibrators are avail to our customers in a very nominal price rates. PF Range 0.5 Lag to Unity to 0.5 Lead. Compliance 20VA, at FS on Voltage & Current channels. 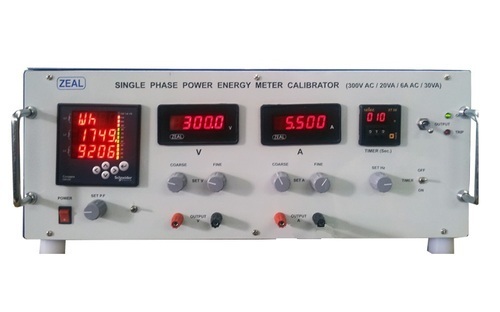 Single Phase Power Energy Meter Calibrator is used for calibration of Energy Meters, Wattmeters, VA Meters, VAr Meters, PF meters. The user can set Voltage, Current, Frequency, Power Factor etc. It is reliable and accurate hence it has demand in Calibration Testing Laboratories, Power Energy meter manufacturers. 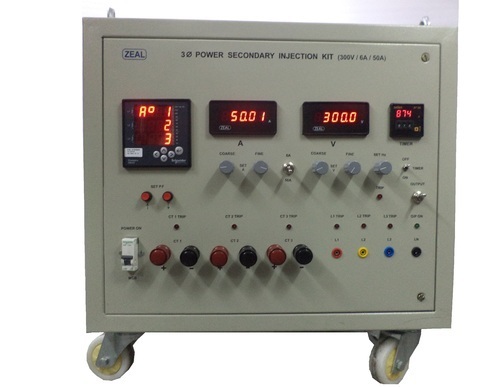 Three Phase Secondary Injection Kit is used for testing of protection relays, power line transducers and calibration of Energy Meters, Wattmeters, VAr Meters, PF meters. The user can set Voltage, Current, Frequency, Power Factor etc. It is reliable and accurate hence it has demand in Calibration Testing Laboratories, Power Energy Meter Manufacturers. Looking for “Power Energy Meter Calibrator”?